This year the Dalton Gang will go out with Dave wearing bib #3 from the starting line in Fairbanks, Alaska on Saturday February 6, 2010! Follow the race action. One ticket to the Start Banquet to join your musher’s table. Access Pass to the staging area pre-race to watch (help) your musher prepare. 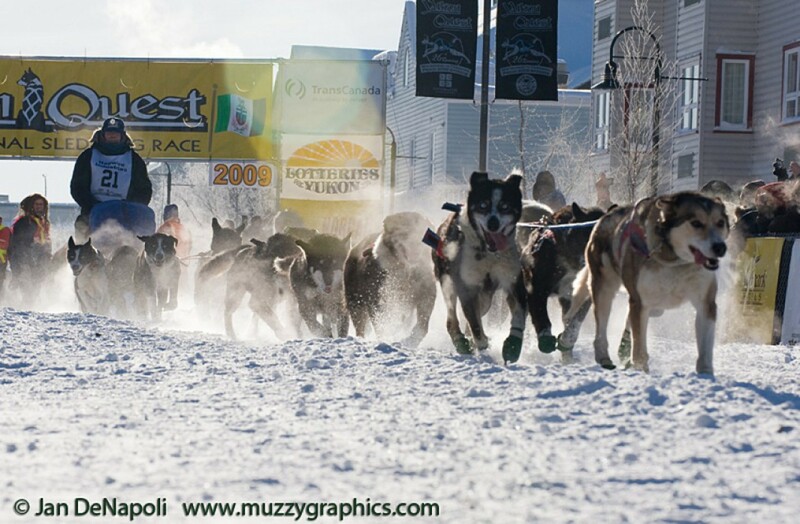 Ride to the start line with your musher (Either on the runners or a volunteer snow machine). Autographed poster signed by your musher. Picture at start line holding sled with your musher in the start chute. Name read by announcer at Start. This year’s race starts on Saturday, February 6, at 11:00 am. The start line is on the Chena River in downtown Fairbanks, Alaska, near the Cushman Street Bridge. The start takes place right in front of the Alaska Race Headquarters at 550 1st Avenue. Come on out, join the fun, and cheer for the Dalton Gang as they begin their 1000 mile quest!! The gang for 2010 includes many young dogs who will be racing the Quest for the first time. We’re going to take it easy and lay in a solid foundation for future races. RACHAEL:8 years old,48 lbs.This will be Rachael’s fourth Quest. She finished twice and a leader. WARTHOG: 9 years old, 58 lbs. This big boy runs in lead with Amy. He is a five year veteran of the Quest, making this his seven year. Warthog is the new stud in the kennel. He’ll be leading his pups to the finish line. Altair: 3 years old, 62lbs .A rookie this year gets so excited about running that he snaps his tug-line. He runs with his buddy Sheldon in wheel. RIO: 9 years old, 65 lbs. Like Warthog, this big guy keeps the team rolling. This will be his seventh Quest. He has finished three times and is one of the main leader. GANGES: 9 years old, 47 lbs. This little powerhouse female will start the race in lead. Ganges stays sharp and focused on what she’s doing and makes sure the rest of the team knows that she expects the same from them. She has finished the last five races. Rio, Danube, and Ganges are all litter mates and have fourteen Quest finishes between them. NICOLE: 8 years old, 47 lbs. Running in lead with Ganges, this fast little girl will also run single lead to make up trail time. Nicole has five Quest finishers. She also will be leading her pups down the trail. Dan: 8 years old, 57 lbs. This will be his fifth Quest. He has finished four times. A leader. JOEY: 8 years old, 60 lbs. The bigger of the brothers (Matt and Dan), Joey fifth start and is back teaming up with his brother Dan in lead. He has four Quest finishes. Zek: 7 years old, 57lbs. Running in lead with Rio, this is Zek’s fifth year on the Quest team. He finished four times and is one of my main leaders. Amy: 7 years old, 48 lbs. Quiet and shy, Amy will be running in her fourth Quest. She has three finishers. Team up with Warthog in lead. Tom: 2 years old , 56 lbs. This will be his rookie year. Runs with his brother Al. Parents Torn and Nicole. Tom also is a alternate leader. Healy: 3 years old , 48 lbs. Is a rookie this year. A sister to Sheldon. Runs with Rachael in lead. Sheldon: 3 years old , 57 lbs. His second race. Runs in wheel with his buddy Altair. Sheldon will be chasing his sister Healy in lead .